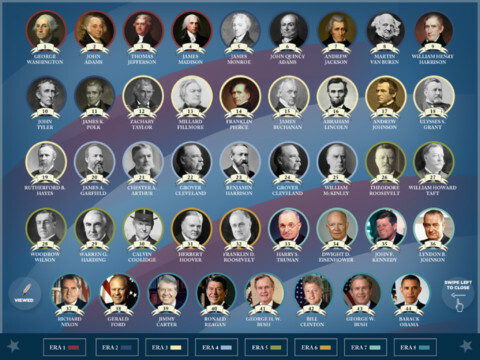 Disney Publishing’s hottest new app is “American Presidents: Unofficial Oval Office Scrapbook.” This app has everything: bobble-headed Millard Fillmore, Mo Rocca, Warren G. Harding’s gambling addiction, Sam Donaldson with epic hair, George Washington’s false teeth, and Ronald Reagan in board shorts. This is not even to mention the app’s rousing rock and roll Muzak, the Forest Gump-style video montages, and lots of 2-D animation. 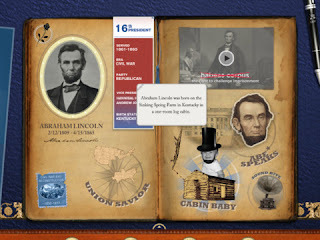 There is important information conveyed in the Disney Presidents app, and there is an honest attempt to make that presentation whimsical and fun. But this is not the The Daily Show or NPR’s Wait, Wait Don’t Tell Me for the elementary school set. So John Stewart or Peter Sagal, if you’re reading this, I’d love to see what you gentlemen could do. DID YOU HEAR THE ONE ABOUT GEORGE WASHINGTON’S TEETH? 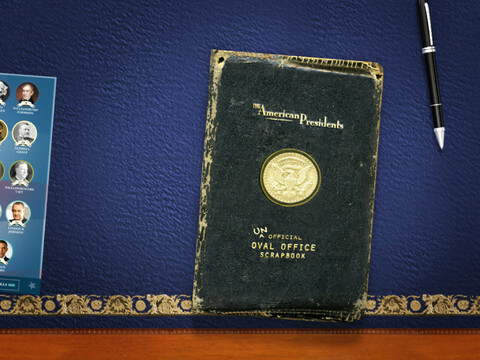 The app, which was created with the help of The Daily Show producers and is available for both iPad and iPhone, opens with a view of the Oval Office and an image of the “unofficial scrap book” atop the president’s desk. 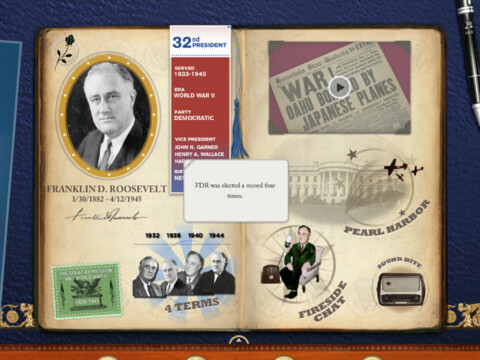 Tapping the scrapbook then takes you to a page featuring 44 presidential faces. Tapping any one of these will bring you to an individual president’s homepage. The homepages include a combination of quick facts ranging from the textbook variety (dates in office, Veep, political party), to the serious (LBJ signed the Civil Rights Act) to the Jeopardy-worthy (Harry Truman coined the phase “the buck stops here”), to the inane (George Washington’s teeth were made of gold and lead but not wood). Pages also have sound bite icons and a one-sentence description of historical context. And then there are the videos. 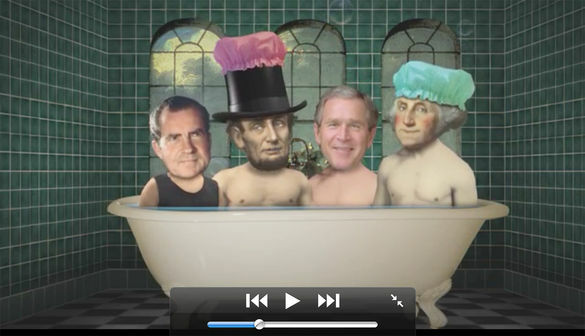 These are in the three- to four-minute range and present an overview of each president’s term in office. Videos are a collage of political cartoons, old photographs, narration about important political events, and interviews with the likes of Jon Meacham, Robert Reich, Paul Begala, Wesley Clark, Sam Donaldson, Melissa Harris-Perry, and Mo Rocca. The videos (like the homepages themselves) are also full of bobble-headed president cartoons. You simply can’t imagine how many bobble heads are in this app. If a kid didn’t know any better, he might think that to be president you have to have an enormous cranium and considerably weak neck support. Why does the president’s app often make our nation’s leaders look like they all sat for a caricaturist at somebody’s bar mitzvah? And why do the sound effects bring to mind a gaggle of honk-nosed clowns piling out of a tiny car? “We took content that in other cases might have been considered less engaging, less exciting and made it approachable and fun,” says Disney Publishing’s Executive Vice President Andrew Sugerman. 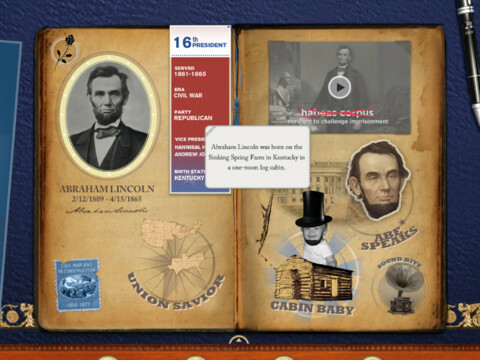 According to Disney, the President’s app is geared toward elementary school kids, starting at grade 3, as well as parents who want their kids to take a greater interest in U.S. history. The idea was “to show the human side of the presidents,” Sugerman explains, and to attach memorable and quirky tidbits to each biography that would stick in kids’ heads and, maybe, help them remember the serious stuff. But the silliness feels somewhat staid and, tonally speaking, it doesn’t mesh with the suit-clad commentators.